As my colleague highlights in a recent blog, the governor’s proposed budget for the next two years fails to meaningfully reinvest in critical public structures, such as public education, that drive the state forward. This reality becomes much clearer when placing the governor’s budget into broader context. Consider state funding for textbooks and other classroom-level resources for public schools. 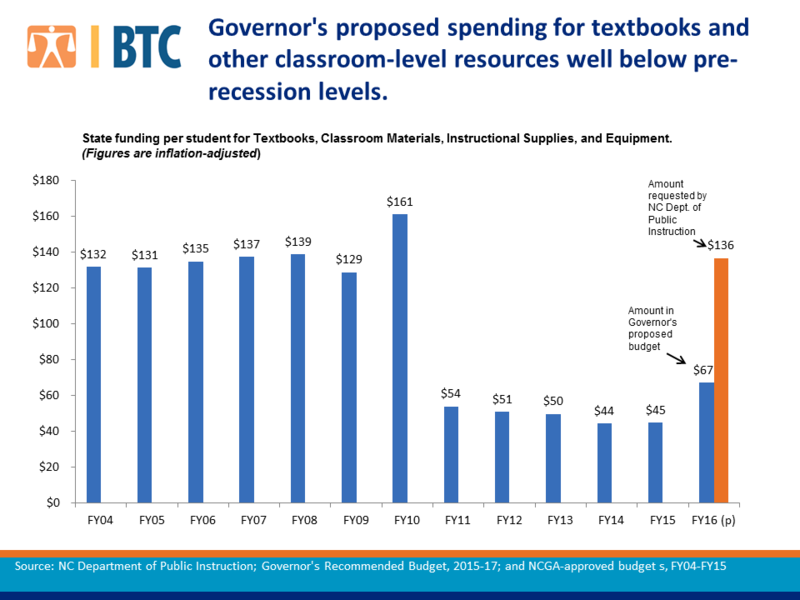 The governor’s proposed budget for FY2016 provides a small boost of $35 million in state funding for textbooks and other classroom-level resources. This spending increase partially restores harmful cuts state lawmakers have enacted since 2011 and is a step in the right direction. However, this is a textbook example of how the state can spend more but still fall short of what is needed to catch up and keep up with the needs of a growing student population. Even with the proposed additional spending for textbooks, classroom materials, instructional supplies, and equipment, total state funding would be around half of the state’s investment level prior to the recession (see chart below). Furthermore, the proposed funding boost provided in the Governor’s budget is barely half of what the Department of Public Instruction requested on behalf of children in the classroom. When presenting his proposed budget last week, the governor acknowledged that his budget is “still extremely very tight” and that tough choices had to be made. This is the result of his decision to sign into law tax cuts that are costing upward of $1 billion per year – a self-inflicted reality that continues to drive underinvestment in public schools and other core areas of the state budget. North Carolina’s public schools play an important role in building a workforce that can compete for good-paying jobs in a dynamic 21st century. Failure to adequately invest in core public structures today will have a direct impact on the state’s future economic prospects. Previous PostConservative NC lawmakers: Denying climate change but at least willing to address one symptomNext Post Assessing fines based upon income?